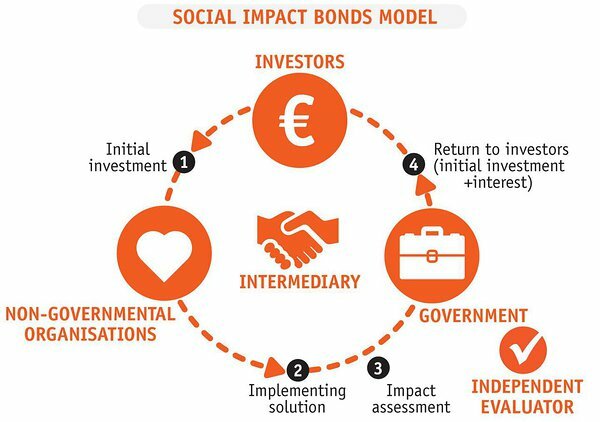 Social Impact Bond (SIB) is a novel investment model aimed at increasing the effectiveness of solutions to social issues. The model enables to engage private resources in testing new solutions and, if successful, replacing the services provided by the government, thereby improving the service quality and triggering savings in the state budget. The successful implementation of the model leads to increased amount of beneficiaries, reduced societal problem, profitable investment for the investor and more capable non-profit organisations. Private investors provide up-front capital for solving one specific societal problem e.g. to reduce offending or unemployment. The problem will be addressed by a capable non-profit organisation that has an innovative and effective approach. If the new solution yields better results than the existing public service during an agreed period of time, the government repays the initial investment plus an agreed rate of return. Repayment shall only be made if independent evaluation shows that the agreed-upon results and impact has indeed been achieved. The first pilot project in the United Kingdom, and in the world, was launched in a cooperative venture between the UK Ministry of Justice and impact investment organisation Social Finance. The goal of the project was to reduce the re-offending by persons released from short-term imprisonment by 7.5% within 12 months after the release. Social Finance raised 5 million pounds from 17 investors to finance a consortium of several organisations that worked during six years with 3,000 persons released from the Peterborough Prison. The program helped the ex-offenders to find permanent residences and jobs as well as offered drug and alcohol aversion therapy, psychological counselling and parenting support services. The parties agreed that if the established goal was reached, the government would reimburse the up-front investment with 13% annual interest to the investors. In the summer of 2014, the results of the first phase were published – the new intervention reduced reconvictions by 8.6%. Final results will be published in 2016. In 2013 ABN AMRO and Start Foundation invested 680,000 euros in the Rotterdam initiative Buzinezzclub that aims to tackle low levels of youth employment in the city. The programme empowers 160 youths aged between 17 and 27 to enter or return to the job market and education. By beginning of 2016, 80 youths had participated in the programme and more than half are no longer on benefits. To date 21 participants have found a job, 19 have returned to school and 7 have set up their own business. The quicker the youths leave the programme successfully, the greater the yield for the investor. The arrangement is that the municipality of Rotterdam pays the investors based on the cost-saving the programme generates (reduced unemployment benefits, increased social tax and income tax). The yield can amount to as much as 12% annually. As the first cohort has been a success, the municipality is planning to recommission a second SIB with Buzinezzclub. Today nearly 50 social impact bonds have been launched across the globe, mostly in the UK and the United States. Several European Union member states, including Finland, Netherlands, Belgium, Germany and Portugal, have also initiated their first social impact bond projects. Furthermore, currently there are around 100 models under construction in different parts of the world. In 2014, the Good Deed Foundation initiated a feasibility study and cost-benefit analysis for launching the first social impact bond in Estonia. The year-long project involved mapping the readiness of Estonia’s public sector, investors and non-profit organisations (NPO) to implement the novel financing model and developing the impact, financial and legal framework. The feasibility study and the cost-benefit analysis provide a strong base for launching the pilot project, the actual set-up however requires further preparations and efforts by all interested parties. 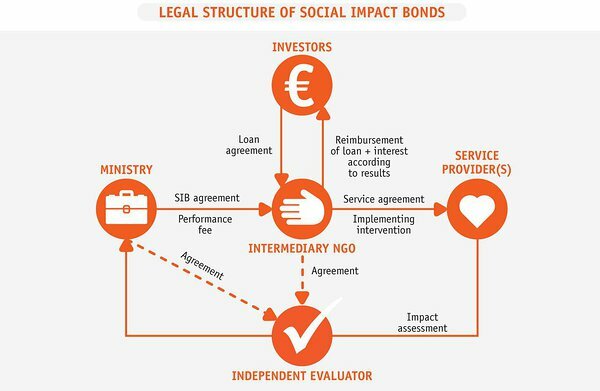 The social impact bond model has been applied around the world to solve a variety of social problems such as facilitating the employment of vulnerable groups, strengthening families by improving parenting skills, rehabilitation of homeless persons and helping children overcome educational lags. However, it should be noted that all social problems cannot be solved through social impact bonds. The problem area has to meet a list of criteria such as availability of data and indicators describing the area, existence of potentially better intervention, cost savings for the state in case of successful intervention etc. After assessing different problem areas to established criteria, the reduction of juvenile re-offending was selected as the most suitable area for the first social impact bond project. Today, there are various sanctions applied to juvenile offenders, including community work, rehabilitation services, a variety of social programs or specialized classes. For the more complicated target group, special institutions have been created to receive education. Nevertheless, almost 1,500 juvenile offenders appear before juvenile committees each year, half of whom are repeat offenders. Furthermore, a majority of youth discharged from special schools commit another offence within two years. As there are significant public expenditures being made in addressing the problem each year, there is a need for more effective and impactful interventions. it works and how can it be adapted and implemented. As a result of mapping the potential interventions, Aggression Replacement Training (ART) was chosen as the most suitable intervention for the first SIB. ART is a cognitive-behavioral intervention program for training social skills such as empathy, anger management and problem-solving, and supports the adoption of ethical decisions. The main target group for ART are children and youth, but the program has been successfully applied to adults as well. The program is implemented in groups facilitated by two trainers. Practical training on developing the skills takes place during 10 consecutive weeks, 3 hours per week. The international practice shows that a suitable size for the group is 6-10 participants, depending on the profile of the participants. In the United States, ART is one of the evidence-based programs which has resulted in lower recidivism rate among the participants compared to a control group. In several other countries such as Norway and Russia, ART is known as a knowledge-based program. In those countries, research has been focused on assessing the changes in the youth’s attitudes, skills and behavioural patterns after completing the program. The logic of social impact bonds requires the contracting party to pay for the service if the novel intervention has been proven to be more effective than the service previously provided and has created costs savings for the state. 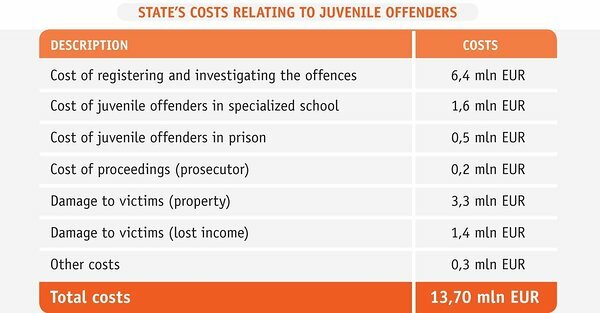 The analysis indicated that the state’s costs relating to juvenile offenders are about 13.7 million euros per year, most of which relates to registering and investigating the offenses and damage caused to the victims. among ART participants would decrease by 22% during the 12 months after the program or 16% for 18 months after the program, the state’s costs and benefits would be in balance. If those numbers could be exceeded, the state would achieve further savings. Therefore, it is likely that scenarios with lower offence reduction rates as a result of the ART program would also be beneficial for the state in the long run. To launch the first social impact bond in Estonia, the state needs to announce a public procurement and conclude a performance-based agreement with the successful bidder. Considering the Estonian context and the readiness of the parties, the optimal solution would be establishing a Special Purpose Vehicle (SPV) that participates in the public procurement. As a legal entity, the SPV would be a non-profit organisation established to act as an intermediary in the project, connecting the other parties of the project, concluding the contracts needed to implement the project and acting as a project manager. c) jointly with the contracting party, an agreement with an independent evaluator to assess whether the agreed-upon results have been achieved and the prerequisites for the outcome payment have been fulfilled. The source of financing depends on the specific social impact bond model (including the legal form of the intermediary) and investors’ preferences (including the level of engagement). In the pilot project the up-front financing will be structured as a loan, deemed to be the most suitable and practical financing method for the selected framework. Depending on the structure of future projects and the participants’ preferences, financing may also take the form of convertible loans, convertible bonds, options or holdings. Launching a SIB can only happen in cooperation with public, private and third sector and by engaging experts in various fields. Do you want to get involved and support the design of the SIB with your know-how or finances? Are you interested in doing research or writing a thesis on the SIB model? Or do you have an intervention in mind that could be scaled with the SIB? Let's talk! Contact pirkko@heategu.ee. Kirsti Akkermann, Pål Christian Bergstrøm, Triin Edovald, Velli Ehasalu, Francois de Borchgrave, Knut Gundersen, Ahti Heinla, Rando Härginen, Katrin Isotamm, Tarmo Jüristo, Heidi Kakko, Ly Kasvandik, Martin Kodar, Anniki Lai, Kai Liiva, Külli Lilleorg, Anna Markina, Allan Marnot, Elise Nikonov, Kati Nikopensius, Antti Perli, Pille Soome, Kaire Tamm, Vaiko Tammeväli, Brit Tammiste, Gunnar Toomemets, Kristiina Treial, Aire Trummal, Magnus Urb, Margus Uudam, Kaido Veske, Taavi Veskimägi, Signe Viimsalu, Kaarel Oja, Risto Oja.